support@advancedmobilegroup.com or use the contact form. or use our Online Service / RMA Request form here. From hardware and software to integration services, our team delivers complete, end-to-end wireless infrastucture RFID solutions — providing unparalleled value to clients of all sizes. 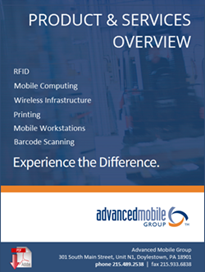 To learn more about how Advanced Mobile Group can help you overcome your RFID challenges and achieve your goals, please contact us today.